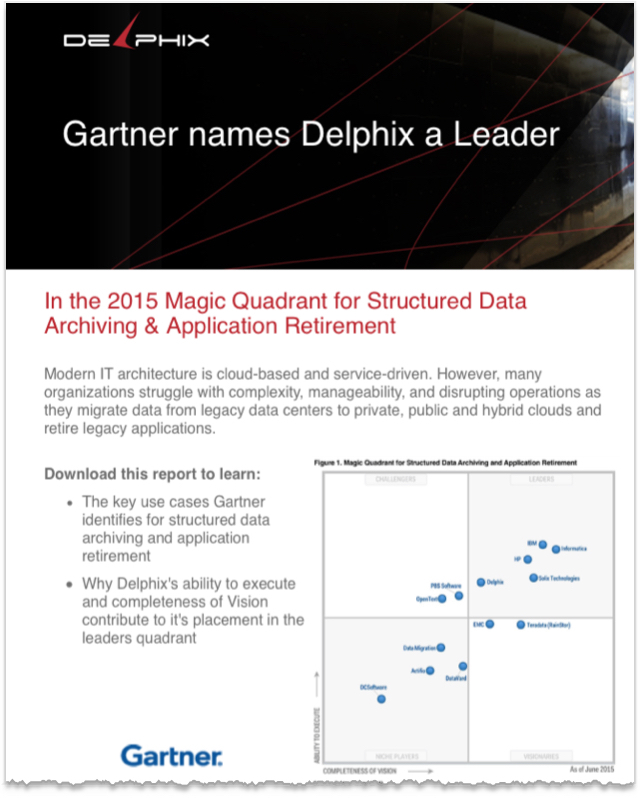 Delphix received a big boost today recognition from Gartner, which placed Delphix in the top Leader's quadrant in its latest Magic Quadrant for Structured Data Archiving and Application Retirement. It's key in cloud migration projects, a complex and risky move made far simpler with Delphix and it's great to get the recognition from Gartner. With Delphix, customers can speed up the complex migration to the cloud and test as they go. Hybrid IT data centers have become essential in enterprise IT plans for all large companies seeking business agility. Delphix provides an "undo" button that takes away many of the risks that IT departments face in migrating their data and applications to hosted services. Delphix preserves all functionality and state enabling databases to be restored in minutes if there's a problem. Gartner's recognition of Delphix, the most recent entrant into the market, is important for both Delphix and the enterprises planning cloud migrations. Gartner's evaluations of tools and technologies are closely followed by IT departments as they try to minimize risks to their businesses. Cloud migration is a major undertaking and it abounds in operational and security risks if mismanaged or the wrong tools are used. The other companies in the Gartner Leadership quadrant are: IBM, HP, Informatica and Solis Technologies. There are eight additional companies in the other quadrants. - A single clone of a production database can be used for testing by multiple app development teams, which speeds up app development by months. - Its data masking creates an unbreakable security layer by over-writing any sensitive data. - It can be used for quick backup and recovery in minutes. - It can free-up large amounts of IT resources in servers and storage because it eliminates the need to host multiple copies of production databases.